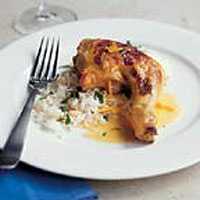 The zesty orange glaze gives a lovely fresh flavour to the chicken portions. Preheat the oven to 220°C, gas mark 7. In a shallow bowl, mix the yogurt with the orange juice, marmalade and mustard, then season. Coat the chicken portions thoroughly with this mixture, then transfer to a roasting pan and cook for 30 minutes. Meanwhile, stir half the chicken stock into the remaining glaze. Remove the chicken from the oven and reduce the heat to 200°C, gas mark 6. Turn the chicken pieces and pour the glaze and stock mixture over them. Return the chicken to the oven for 15 minutes or until cooked: the juices should run clear when the meat is pierced with a skewer. Turn the oven off and leave the chicken to rest for 5 minutes with the oven door open. Transfer the chicken onto warmed plates. Stir the remaining stock into the roasting pan juices, bring to the boil on the hob, then spoon over the chicken. Serve with 200g basmati rice, cooked according to the pack instructions in chicken stock. Add 2 tablespoons of pine kernels to the rice for the last 5 minutes of the cooking time. Drain and stir in a knob of butter and some flat leaf parsley. 160g bag Waitrose Nantaise Salad with a lemon juice and olive oil dressing.